At eEuroparts.com, we take great pride in providing you with the best quality Volvo 244 parts possible. We have expanded our inventory to include a variety of different Volvo 244 parts that you might need. The Volvo 244 dates back to August of 1974 when a new generation of vehicles was introduced by Volvo. Known as the 240 series and the 260 series, these new models originated from the 140 series. In fact, the new Volvo 244 shared many things in common with the original 140 series. There were also new changes to the Volvo 244. Such changes included larger bumpers, a new front, and a more developed chassis. Another major change to the new lineup is that the 240 Volvo family also included a new 4-cylinder engine that specified the use of an overhead camshaft. In addition, the new Volvo 244 also featured a McPherson front-wheel suspension system. Consumers could also take advantage, for a short period of time, of specifying a V6 engine for their Volvo 244. In 1978, the first 6-cylinder diesel engine was introduced in a passenger car for the first time. The new 240 series also sported a number of safety requirements that were new to the market. These new safety requirements were so rigorous that they eventually became the standard for safety requirements in the United States. In many ways the Volvo 240 series, including the 244, became a classic. 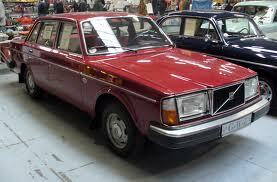 This model received a facelift in both 1981 and 1986, with the inclusion of new Volvo 244 parts.